We are simple people with great plans in life: To get out of Rat Race and be financially free throughout our lives. Without our parents, we are nothing in this world. My parents, Mr. Ernesto Lorque Casas and Ms. Estelita Conjusta Manimbayan got united on March 25, 1974 at Jelicuon Montinola Parish church. 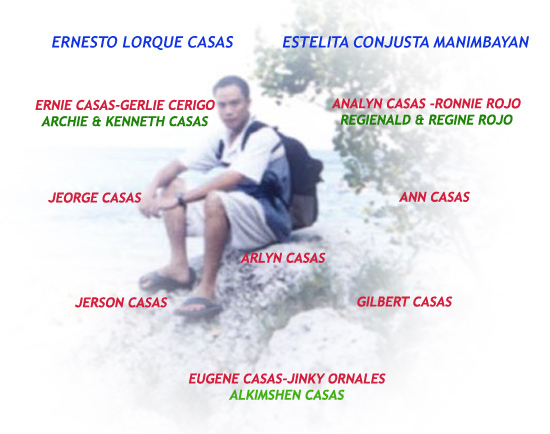 They beget 8 children namely; Annalyn, Ernie, Yours truly, Ann, Jeorge, Gilbert, Jerson and Arlyn. Thru sacrifices of our Parents and other relatives (Ne Mildred & Tiyoy Basil, Ne Erly, Ne Fely), I finished my college education.